If you’ve been looking for a high quality stainless steel complete cookware set, hurry and grab this huge price drop on the 5-star rated All-Clad 700393 MC2 Professional Master Chef 2 18-10 Stainless Steel Tri-Ply Bonded Cookware Set, 7-Piece, Silver ! Today only, Amazon has dropped the price down to $299.99 with FREE Shipping. As a price comparison, Macy’s sells this same set for $489.99 plus shipping, so this is a fantastic price! Why cook with to stainless steel? One of the chemicals in non-stick cookware is PFOA (perflourooctanoic acid), which is a known carcinogen (cancer causing chemical) and dangerous toxin. Exposure to this chemical has caused kidney failure, liver and pancreatic cancers, thyroid disfunction and hormonal disorders. When babies are exposed to this (through pregnancy or a breastfeeding mom) it can cause developmental delays and even SIDS. Many people turn to cast iron to avoid non-stick cookware,however, this may not be the best choice. Cast iron cookware leaches iron into the food. If this cookware is used frequently, this can cause dangerous levels of iron in men and post-menopausal women. 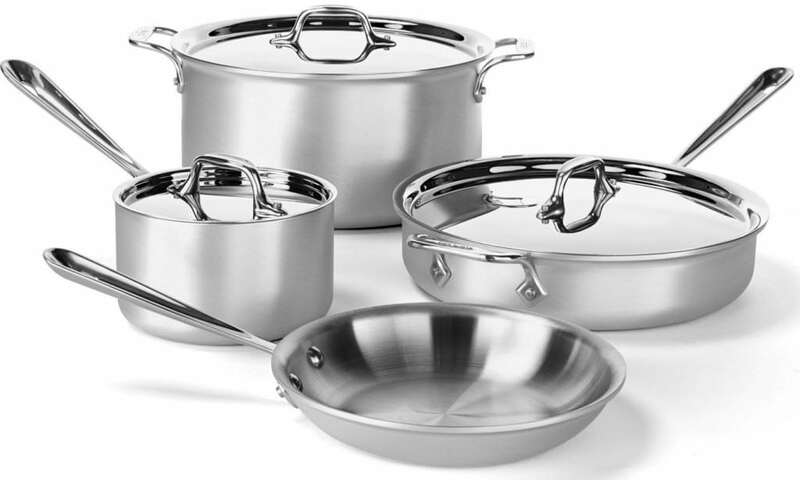 The best choice for cookware is stainless steel. Stainless steel cookware is chemical-free and will not leach anything harmful into your food. *Price accurate at time of posting.